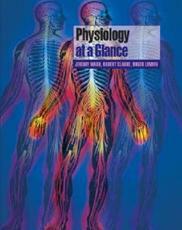 "Physiology at a Glance" provides an accessibly concise introduction to Physiology. It covers core knowledge required by medical and biomedical students, junior doctors and nurses for their physiology courses. The book follows the easy-to-use at a glance format of double page spreads composed of clear memorable diagrams that support accompanying key facts and essential information. The content of the book is organised around body systems: introduction to physiology, the cardiovascular system, the respiratory system, the renal system, the gut and metabolism, endocrinology and reproduction, muscles, and the sensory and motor systems. "Physiology at a Glance" is an essential resource for students, junior doctors and anyone following introductory physiology courses. This is an ideal text for thorough understanding of physiology and will be perfect for exam revision - fitting even the tightest of budgets!